During this past year, one bonus from publishing Stumbling Stone has been the authors we’ve met, some with stories similar to ours or in some way related to the same time period. Mani Feniger wrote in The Woman in the Photograph about learning secrets from her mother’s childhood in Leipzig, Germany. During her research, Mani discovered the home her mother lived in has since been demolished. 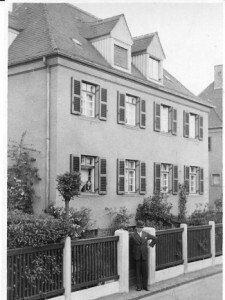 Hermann Raab (Rudi’s grandfather) in front of his house in Leipzig in 1937. One of the critical scenes in our Stumbling Stone novel describes Karl and Sarah’s trip to Leipzig, Germany. They are looking for answers to Sarah’s insistent questions about what Karl’s German family did during World War II. That chapter is based on author Rudi Raab’s recollection of a visit to his grandfather’s home in that city. The address of the house is Eduart von Hartmann Strasse 12. I looked at Karl as he slowly explored the hallway and the living room. I followed him into the kitchen. I could not believe it. Even the stove was an antique. It was coal-fired, had an iron plate as a stovetop and individual rings that you could remove to expose the pots directly to the fire. We did various kinds of research during the 25 years that we worked on the book but only recently, after we read Mani Feniger’s book and heard her mother’s history, did we use Google Earth to see whether Rudi’s grandfather’s house was still standing. 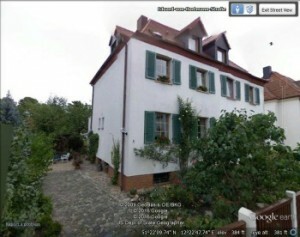 Above is a photo of Hermann Raab in front of that house in 1937 and to the right, the Google Earth photo. So much of Germany was destroyed by Allied bombs that it is always amazing to see a building from that era intact. Rudi remembers his grandfather showing him the new plastic gutters that he installed on the house during the post-war Communist era. He said, with a cynical smirk, “at least they will never rust.” He obviously knew they would not last as long as the metal ones they were replacing. Indeed, the Google Earth photo shows new gutters as well as new paint and new windows. And the same old fence.